This is an excellent comprehensive summary of the 20+ most common handgun calibers, this article will help you choose the best loads for use in self defense situations. If you are new to shooting and self defense this will become one of the most important articles you ever read. If you’ve been around awhile this will still shed some light on a few things we are sure. The article is based off original work from Evan Marshall, Massad Ayood, and Ed Sanow. It has been rewritten and updated as needed. These guys are the best in the world at cartridge and round analysis. This page will also tell you which loads to carry and which loads to avoid at all cost due to their ineffectiveness. These facts are the real deal and not some forum ranting. Bookmark this page by hitting Ctrl + D. Be sure to share with your friends and love ones, help keep them informed and safe. If you want more information on a specific round click on the “Learn more about” link at the bottom of that cartridges summary. Thanks for reading. It is recommended that people carry something bigger than .22 LR for self-defense purposes due to how small the rounds are in addition to the lack of stopping power compared to higher caliber cartridges available on the market. There are .22 pocket autos that are a good firearm to carry for women who are uneasy about being able to carry a larger caliber pistol. Choose any Federal, Remington, Winchester or CCI copper-plated 37 grain (or lighter) high velocity hollow point round. I recommend CCI “Stinger” 32-gr. or Remington “Yellow Jacket” 33-gr. hollow points, as they have been very reliable in my Beretta 21A and Walther TPH pistols and have the highest stopping power ratings. Ammunition is inexpensive for .22 LR, so it is best to shoot a lot of rounds through the self-defense .22 to determine what round is the most reliable in getting the job done. There are high-velocity and standard velocity bullets, and if one type does not cycle through your pistol try the other to see which performs best during practice sessions. In addition, practice being able to draw the firearm and being able to fire it at a target that is at a distance of around 10 feet. Pistols can get dirty while carrying them around as protection. Be sure to clean and inspect a self-defense pistol every day after carrying it around so it does not get dirt and gunk in it that could possibly cause it to jam. This is a better caliber to use than the .22 LR and could be considered to be better than most other calibers smaller than .35. 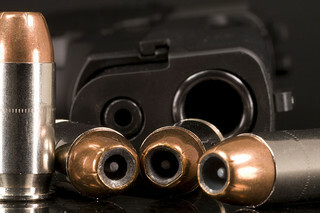 The 40 grain JHP load is the most common choice. This includes Winchester 40 grain JHP load, which scores higher than other cartridges in a 4 inch or longer test barrel. The 40 grain Speer GDHP-SB is more suited for smaller pistols or mini revolvers that have 2 inch or shorter barrels. The best load for the .25 ACP is the Hornady 35 grain XTP-HP round. If that round does not work well in your particular firearm, then use Federal, Remington, or Winchester 50 grain ball rounds. Another reliable round is the Winchester 45 grain “Expanding Point” that works ok in pistols such as the Beretta 950. There isn’t any improvement in performance over the .50 grain round balls though. The Walther TPH should be loaded with ball rounds. Hornady has a 35 grain JHP that can be considered 100% reliable in owner’s pistols. Owners should use well over 150 rounds to see the reliability of the 35 grain JHP. Ed Sanow Recommends the MagSafe 22 grain “Defender” and Glaser 40 grain Safety Slug rounds. The Winchester 60 grain Silvertip Jacketed Hollow Point (X32ASHP) can be tested for reliability in firearms. The recommended firearm for the Silvertip is the Seecamp LWS .32. The .32 autos are only reliable at shooting with 71 grain ball rounds such as Llama, Walther PP and PPK, Czech CZ-24 and CZ-70, David P-32, Colt Pocket Model, and the Mauser HSc in addition to other pistols. The best load is the Federal .98 grain lead wadcutter. The revolver has become obsolete though and should be replaced with a more up to date self-defense firearm. You should use Federal 85 grain Jacketed Hollow Point (C32HRB). You should use Federal Premium 85 grain Hydra-Shock Jacketed hollow point rounds. This caliber is considered obsolete, but if a shooter chooses to use this caliber use the Fiocchi 7.63 Mauser ball. 87 Ball grain ammunition is available and pistols are CZ-52 or the Chinese Tokarev. This is first caliber that is considered decent in stopping power. The three best out of four .380 JHP rounds have better stopping power than ANY bullet fired out of a two inch barrel .38 Special snub-nose. All of the five main stream manufactures make reliable hollow points for this caliber. The Remington 88 grain JHP is the more reliable cartridge when it comes to feeding hollow point rounds into a chamber , but is also considered a little less effective than the Hydra-Shok or CorBon. Testing rounds for their reliability in your firearm is necessary to determine which best suites the firearm you prefer to carry. -Federal 90 gr. Hydra-shok (P380HS1 H) – the best standard-pressure .380 JHP load, period. -Cor-Bon 90 gr. JHP – the most powerful .380 hollow point, bar none. SIG/Sauer P230, Beretta 84/85, Browning BDA, CZ-83, H&K P7K3, Walther PPK and PPK/s. The Russian, East German, Chinese and Bulgarian Makarov pistols are apparently perfectly reliable with the hot Cor-Bon, and the strong all-steel construction of these guns should stand up to an infinite amount of these potent rounds. I have heard that the Colt does also well with the hot Cor-Bon JHP, which you should definitely look into if you own a Colt .380. You have better stopping power than any .38 snub-nose revolver (the long-time favorite concealment sidearm) when you load your .380 with these two rounds. Remington 102 gr. Golden Saber BJHP (GS380M) – Another excellent .380 load (the BJHP stands for “Brass Jacketed Hollow Point”), the heaviest one available. I prefer the Cor-Bon and Hydra-shok, but many (including Sanow) like this new Remington round for its deeper penetration. I’ll stick with the Cor-Bon and Hydra-shok, but the choice is yours. CCI-Speer 90 gr. Gold Dot JHP a good all-around hollow point. Remington 88 gr. JHP (R380AI): A good high-velocity hollow point that feeds well in: Colt Government Model .380, H&K HK4, Taurus PT-58, older PP and PPK, Bersa .380, Beretta 70s, Makarov and Hungarian FEG. These are all good guns that might choke on other hollow points but they will probably feed the Remington fine. This hollow point was redesigned in 1993 and gives excellent performance while retaining its rounded shape for positive feeding. If your .380 chokes on other JHP loads, try fifty rounds of the Remington 88 gr. through your gun and see if it improves. -Winchester 85 gr Silvertip (X380ASHP) We really cannot recommend this weak and jam-prone round. It works reliably in a few modern European guns (e.g. SIG 230, Beretta 84F), but every load named above offers better performance. The Silvertip will likely jam in any American-made .380 automatic. Russian .380 Makarovs and PPK series guns may jam with the Silvertip, as well. The .380 Silvertip was once state-of-the-art, but has since been superseded by superior designs. It is also quite expensive. Look elsewhere. PMC-Eldorado Star fire 95 gr. JHP This round is similarly weak and jam-prone. Hornady 90 gr. XTP-HP (9010) Both the Federal 380BP and the Hornady XTP-HP never expand and may jam many guns due to their truncated-cone bullet nose profiles. Pass by these two. Davis P-380, Accu-Tek, EAA .380, Tanarmi, AMT/OMC/TDE “Back-Up,” Heritage, FIE, Jennings, Bryco, Lorcin, Llama, or “other.” Hollow points should never be used in these low-priced guns. -Cor-Bon makes an excellent 95 grain JHP that is totally reliable in all East Bloc pistols. -Hornady offers a 95 grain JHP/XTP (#91002). The .38 Revolvers with barrels four inches or longer : The number one .38 Special defense load for your 4″ barrel revolver is the Cor-Bon .38 Special+P 125 grain JHP. It has a high pressure load and should only be used in modern six-shot revolvers. The recoil and muzzle flip is lower than the second choice listed below. When carrying a .38 with a four inch barrel it should be loaded with this. The second choice is the .38 Special +P 158 grain lead semi-wadcutter hollow point (LSWCHP) available from Federal, CCI, Winchester and Remington. Ayoob has found the latter to have the greatest expansion, so I would choose Remington. The unjacketed around is all-lead and is often referred to as the “FBI load” or “Chicago load”, and it is a proven man stopper when it is fired from a 4 inch barrel. A fixed sight .38 revolver can shoot point-of-aim with this load in most cases. Lighter bullets will normally shoot low or very low in some cases. All fixed sight .38’s are regulated at the factory to shoot accurate with standard factory loaded 158 grain bullets, because this is the standard the Canadian and American police forces use to use in their loads. Federal makes the FBI load in their Nyclad line covered with a thin Nylon jacket to prevent leading (#P38G). This is now a police only load. The all-lead version is #38G. CCI offers the famous FBI load in their economical aluminum-cased Blazer line (#3523). This is a bargain. What I really recommend, however, is that for practice you use the CCI Blazer 158 grain JACKETED hollow point (#3526) because it duplicates the ballistics and recoil of the FBI load without fouling your barrel with hard-to-scrub-out lead deposits. This makes them difficult and painful to clean, although you can use Flitz metal polish with good results. This also removes “burn rings” that are unsightly to look at from the cylinder face of a stainless steel revolver. The .38 Special ammunition is loaded with two pressure levels, which are the standard pressure and the +P. The standard pressure loads can be used in any .38 Special Revolver, while the +P loads should be fired extensively only in steel-frame .38 Special Revolvers. Firing under 50 +P loads in an aluminum frame .38 Special revolver will not destroy the frame or cause it to explode, but it will damage the frame of the revolver if more than 100 rounds are fired through it. The problem with carrying +P .38 Special loads in an aluminum frame revolver for the .38 Special is the recoil is heavy and slows the ability to fire repeated shots at a target. This makes the standard pressure ammunition better for use when considering carrying for self-defense purposes since it is easier to fire extra shots after each round is fired. IMI-Samson also offers a lightweight, very high pressure load, the 110 gr. +P+ JHP. This is said to be a ballistic duplicate of the law-enforcement-only “Treasury” load that T-men used to carry. Who cares? The Cor-Bon 125 gr. +P load is superior. And never use any 147 grain bullet in any caliber. They are cursed. All major manufacturers catalog light .38 +P hollow points, from 95-129 grains. None of these are as successful as the Cor-Bon .38 Special +P 125 grain JHP or 158 grain +P LSWCHP, so why carry them? Light +P loads only make sense in a 2″ barrel snub (more on this later). The Federal Hydra-shok and Winchester Silvertip may look cool, but the boring-looking Cor-Bon and FBI loads do the job in a 4″ revolver. Stick with them. The 66 grain bullet made by PMC is not recommended. Also avoid the Remington 95 grain +P SJHP (R38S1) due to inadequate penetration. The Glaser Safety Slug is a recommended choice for use in a .38 revolver with any barrel length. Owners should be aware that keeping the chambers and frame interior 100-percent free of oil and solvents is necessary when carrying Glasers. The CLP can leak into the primer pockets causing the round to become defective and not fire. This is also important for consideration on all rounds that are being carried for self-defense purposes, but Glaser isn’t known for particularly good sealing against such incidents happening. Owners should also consider carrying two Glasers as the first rounds to be fired, and JHP loads for the rest. This is because JHP rounds have better penetration in case an attacker hides behind an object such as a doorway or sheet rock wall that a JHP bullet can penetrate. The Snub-Nose .38 revolvers with 2 or 3 inch barrels loaded with Cor-Bon Special +P 125 grain JHP and 158 grain LSWCHP FBI load are not as good as other choices for 2 or 3 inch barrels on revolvers. The short barrel does not allow for enough muzzle velocity to enable proper expansion on bullets with these loads. The recoil also is a factor due to its hard to control kick that decreases the accuracy and has been known to hurt people’s hands when firing. Federal 125 grain +P Nyclad LSWHP (P38N) – my preferred .38 2″ barrel snub-nose revolver load (a.k.a. the “Chief’s Special” load, now available only to the police). Cor-Bon 110 grain +P JHP – I would recommend this high-pressure load only for the sturdy (and heavy) Ruger SP101 snub-nose .38 or .357 Magnum revolver. Standard Pressure (non +P ) Loads. For those who carry a aluminum frame snub nose .38 such as a Smith & Wesson M38 Bodyguard or a Colt Cobra, it is best to use standard pressure .38 caliber rounds and not +P rounds. The Federal 125 grain Nyclad lead hollow point (P38M) is the best standard pressure load currently on the market. It is known as the “Chief’s Special Load” and was designed to expand at lower velocities. It is the best choice and currently is only available for police department use for officers only. The Winchester Silvertip 110 grain JHP (X38S9HP) is another standard pressure load that can be used for the .38 aluminum frame snub nose revolvers. The third choice is Federal Low Recoil Personal Defense 110 grain Hydra-Shok JHP load (PD38HS3 H). Note well: if you have a J-frame Smith & Wesson snub-nose .38 (i.e. the five-shot Model 36/37 Chief’s Special, Model 38/49/649 Bodyguard, the 640/642/442/940 Centennial) you can greatly improve the controllability of your gun by installing Uncle Mike’s “Boot Grip.” This is a $14 godsend. The skinny little wooden grips that come on these guns are worthless. Installing good grips does wonders for your ability to control your .38 snub-nose revolver in rapid fire for more hits. The 9mm is the most popular pistol round in the world. This has allowed it to be subject to a large amount of experimentation over the years, because the 9mm ball is used by every Army in the Western world has been shown to be a low quality man stopper compared to other caliber rounds. Jacketed hollow points are necessary if an owner wishes to use the 9mm as a self-defense round. Ball ammunition should be used for practice shots on a pistol only. The 9mm is available in standard pressure load along with the +P load. The +P load should only be used in firearms that were made after 1985. They should also be used sparingly compared to standard loads. There are special loads available to law enforcement personnel, but commercial loads are just as good and in some cases better than the restricted loads reserved for law enforcement officials. The 9mm Luger is considered the best self-defense pistol to use with Cor-Bon 9mm 115 grain +P Jacketed Hollow Point bullets. This is the most powerful cartridge available and a proven man stopper for the 9mm caliber of bullets. The muzzle velocity is 1,340 ft/s and the high pressure round is more effective than the non-commercial market rounds law enforcement officials have at their disposal. Unfortunately, it is also likely to jam many older guns. For this reason I add a table at the end of the 9mm section discussing round suitability for different guns. Modern hollow points may either (a) jam, or (b) be too powerful for some older guns. This load is suitable only for First Class pistols (see table). The Federal 115 grain JHP (98P) is the best standard pressure 9mm cartridge on the market. It is effective and accurate, which makes it the set-standard across the globe. Other excellent 9mm standard pressure cartridges are Winchester Silvertip 115 grain (X9MMSHP), and Federal factory load 124 grain Hydra-Shok (P9HS1). Remington also offers a cartridge for shooters who may have issues with jams on the ones listed above. The Remington 115 grain +P JHP (R9MM6) is good for firearms after 1985 and standard pressure 115 grain JHP can be used on all pistols before or after 1985. Remington 88 grain 9mm JHP (R9MM5) this bullet is far too light. They are considered very reliable and high-quality new firearms that can feed any hollow point along with tolerating +P factory loads with no problems. SIG/Sauer P220 series. Czech CZ75 and CZ85. Walther P5, P5C, and P88. Heckler and Koch USP and P7 series. All Glocks. All Ruger 9mm pistols. Taurus PT-99, PT-92 and PT-92C. Steyr GB. Beretta 92 series. Browning BDM and Hi-Power (if it says “Portugal” on the slide). All Smith & Wessons with a four-digit model number (e.g. 5906, 3913, 6904, 5903) and the Smith & Wesson 900 series. Star M28, M30, M31, and all Firestars, Megastars, and Ultrastars. They are also high-quality guns that may not feed all hollow points with the same reliability as first class pistols. Remington 115 grain hollow points are the recommended cartridge of choice for these firearms. Ball rounds are the most reliable rounds for these pistols. Practice will let you know what works best for your particular pistol for self-defense use in a real life situation. Walther P38, P4 or P1. Luger. Llama. Maverick. MKS Model JS. Intratec CAT-9, DC-9, KG-9, etc. SWD Cobray Model 11/9 and similar models. Scarab Scorpion. Kimel AP-9. Bryco Jennings Model 59. All KBI Hungarian pistols (e.g. GKK, PJ9C, P9HK and other “FEG” products). “Norinco” or “Sportarms” Chinese Tokarev pistols. Lahti. Radom. MAB P15 and Model 1950. Cor-Bon, Winchester and Remington make good jacketed hollow point rounds in the .38 Super. The Cor-Bon 115 and 124 grain hollow points are considered the best for self-defense. The Remington feeds more smoothly in many guns. The Colts however, including the Colt M1911A1 such as the Springfield Armory and Auto-Ordnance. The Llama .38 Super has a tendency to jam with any other cartridge except ball rounds. The most effective handgun round currently on the commercial market is the Federal .357 Magnum 125 grain jacketed hollow point (357B). The .357 Federal load has more stopping power than any other handgun bullet including more powerful rounds such as the .44 Magnum. All experienced revolver men should carry the Federal 357B in a .357 Revolver, or the Remington full-power 125 grain semi-jacketed hollow point is just as good (R357M1). The 357B has one warning though. The .357B along with other .357 Magnum cartridges have a large kick that may make it uncomfortable for some people to carry. The noise is also an issue, some shooters may not be comfortable with the loud noise it produces compared to other rounds. There are lower recoil rounds for the .357 on the market though for people who do not feel they want to carry the .357B in a revolver, in addition they will have less kick that will make it easier to fire off more rounds with better accuracy. Every .357 load has a good amount of stopping power for self-defense purposes. In descending order of severity of recoil (i.e. the Silvertip kicks the most) I recommend the Winchester Silvertip 145 grain JHP (X357SHP), The Remington Golden Saber 125 grain JHP (GS357MA), Federal 110 gr. JHP (357D), Remington Medium Velocity 125 grain Semi-Jacketed Hollow point (R357M11) and the Cor-Bon 110 grain JHP. The latter two are excellent rounds I strongly recommend for .357 Magnum 2.5″ and 3″ barrel snub-nose revolvers like the S&W Models 66, 19, 65, 13, the Colt King Cobra, the Ruger GP100 and especially the small-frame Ruger SP101. If you still find that your .357 kicks too much, carry the Cor-Bon .38 Special+P 110 grain JHP discussed above. Two or three hits with good .38+P slugs beat any number of misses with .357 slugs. Caution: Shooters that are using factory wood stocks on Smith and & Wesson along with Taurus .357 revolvers should get a set of rubber replacement grips. Ruger and Colt .357 Magnums come factory-equipped with recoil-absorbing ergo dynamic rubber grips, and the S&W along with the Tuarus put wood grips on their .357 versions. The control between the two types is substantial when firing rounds. Compact rubber grips from Uncle Mike’s or Pachmayr work well with .357 revolvers. They are inexpensive and will cut down on any firing issues, along with increased accuracy after replacing the wood stock. The 125 grain jacketed hollow points by Cor-Bon, Winchester, and CCI are all good stoppers. The CCI Blazer 125 grain jacketed hollow-point is a very good buy, both for practice and self-defense use. The 110 grain jacketed hollow points by Winchester, CCI and Remington are all good for use in snub-nose revolvers, or for those sensitive to recoil. You never go wrong with a 110-125 grain .357 jacketed hollow point from the Big Five. All are great stoppers. Crappy .357 Magnum loads you should not carry for self-defense. Never carry soft-points, semi-wadcutters, or any of the 158 grain or 180 grain jacketed hollow points – these are solely for hunting or target use. Stick to jacketed hollow points under 150 grains in weight. The heavier bullets kick heavily and will shoot high and confuse you. All-lead bullets are okay for practice but you will have to spend twice as long cleaning your gun. This is a tested caliber that has been proven to be effective in having stopping power against attackers. Smith & Wesson and Winchester did a thorough job on research when developing the .40 S&W. The 180 grain jacketed hollow points and the 135-155 grains from Cor-Bon, Winchester, Federal, CCI or Remington are the best choices. All have the stopping power needed for self-defense use, and the lighter weight bullets are known to have the best stopping power according to records from people using them in real life situations. The real-world shooting database clearly favors the lighter 135-155 gr. JHP loads. It is recommended owners carry the potent Cor-Bon 135 or 150 grain jacketed hollow point or the Winchester Silvertip 155 grain jacketed hollow point (X40SWSTHP). The 135-155 grain JHP kicks less and has higher kinetic energy and stopping power than the 180 gr. JHP loads. The 135 gr. JHP appears to be a real stopper. In short, you cannot go wrong with the .40 S&W – unless you carry ball. Choose a good hollow point and stick with it. Leave the ball for practice (the CCI Blazer 180 grain TMJ is a good inexpensive practice round). The 10mm is a heavy duty cartridge originally designed to be the FBI’s primary cartridge. It was however more than most agents could handle so it was cut down short and made into the 40 Smith & Wesson. If you can handle this round it’s a great choice. The 10mm Auto ammunition is available in two power levels for people to purchase. The first is called “full-house” and second “medium velocity”, which is used by the FBI and called “10mm Lite”. The “full-house” loads are designed for hunting purposes and have a heavy recoil and large wound penetration, in addition to causing a lot of wear on firearms. The medium velocity ammunition is better suited for self-defense purposes. Pick the Cor-Bon 135 grain Nosler JHP, Federal 155 grain JHP (10E), or Federal Hydra-shok 155 gr. JHP (P40HS2). The “FBI load” is the 180 grain subsonic JHP, and Federal, Winchester, and Remington all produce good ones. Take your pick, but you are silly to ignore the superior real-world performance of the lighter 135-155 grain jacketed hollow points. The potent Winchester Silvertip 175 grain JHP (X10MMSTHP) is close in power to the “full-house” loads, and may be a good choice for an experienced shooter who is used to heavy recoil. Carrying the Silvertip or “full-house” loads are recommended for shooting animals. The best defense choice for this hard-kicking caliber is the Winchester Silvertip 175 grain JHP (X41MSTHP2). The Remington 170 grain Semi-Jacketed Hollow point (R41MG3) is also a good round. By far the best choice for your .44 Special revolver is the Cor-Bon 180 grain JHP. Glasers or the Winchester Silvertip 200 grain JHP (X44STHPS2) are also good rounds, particularly for any 5-shot .44 revolver. The .44 Magnum has a recoil problem from the force it produces while shooting. This makes it a poor choice for a self-defense caliber. Cor-Bon and Federal have 180 grain medium velocity JHP bullets that are the best choices for the .44 Magnum. Glasers along with Winchester’s Silvertip 210 grain JHP (X44MSTHP2) and Federal’s 240 grain Hydra-Shock (P44HS1) are also good choices that will work well for self-defense purposes. Federal 230 grain Hydrashok JHP (P45HS1): a great load, and my #1 choice. It gives the most stopping power in this potent caliber. Federal 185 grain JHP (45C) another top-notch load from Federal. I would choose this round for a compact, short-barreled .45 like the Colt Officer’s ACP or the S&W 4516. It has lighter recoil than the Hydrashok or CCI 200 JHP, and its higher velocity makes it more likely to expand out of a short 3.5″ barrel. Remington 185 grain JHP (R45AP2). This is the best choice for older guns that may jam with other hollow-points. I would select this load for the Heckler and Koch P9S, Browning BDA, Springfield Armory, AMT and Thompson M1911A1, Llama, Star PD, etc. Cor-Bon and Remington .45+P 185 grain JHP (R45AP6). These cartridges are very powerful and have a hard recoil when fired. They are best suited for experienced shooters who can handle the recoil during a high stress situation. They are also hard on guns, including aluminum frame pistols such as SIG/Sauer P220 or the Colt Lightweight Commander. The +P rounds are the second best choice for stopping power behind the Hydra-Shok rounds. Save the 230 grain ball (FMJ) loads for practice; carry FMJ ammo only if you must because your gun jams with hollow points. The Llama, Federal Ordnance, AMT, and Auto-Ordnance M1911A1 copies often jam with anything except 230 grain ball. Never compromise when it comes to reliability: if your gun only feeds ball, then ball is what you carry. The self-defense .45 Colt should be a good double-action design like the Smith & Wesson Model 25 and not some single-action hunting gun. Load your revolver with the Cor-Bon 200 grain JHP. The Federal 225 gr. Lead Semi-Wadcutter Hollow point (45LCA) or Winchester 225 gr. Silvertip JHP (X45CSHP2) are also good choices for self-defense cartridges.